Christians in Context: from orthodoxy to orthopraxy. : Coming Soon: Augmented "Reality"
NPR's On The Media aired a story this past weekend about the future of Augmented Reality (AR) technology. You'll have to give it a listen (it's about 5 minutes long) and decide for yourself whether the story is credible or incredulous, but according to experts at think tanks and institutions like MIT, this technology will soon permeate our society, allowing individuals to wear devices that will be able to censor images and even other people at the discretion of the wearer. The futurists and AR engineers can see it now: you'll be walking down the street with a thin, futuristic looking pair of glasses on, experiencing reality in a whole new, amazing way. Your software will have your friends' images captured and will alert you to their approach, even in a large crowd of people. Others, those with whom you may have a known disagreement with or dislike for, will also be recognized and you will be warned to avoid them. The glasses will also be able to block out advertisements and obscene images, and may perhaps even be able to project other images in their place, images that you find more palatable. Parents could keep their children from being exposed to sexual images or political ideas, ensuring that the apple falls closer to the tree than ever! Teachers could cause the software to randomly project formulas, equations, and elements on blank walls, improving standardized test scores. What an exciting future, right? I want to be careful not to decry new technology as such. Amish I am not. I don't think the advent of the internet necessarily means the downfall of our societies, nor do I think that there are not any positive uses of such a technology as AR. Perhaps there are some ways in which AR could help people in certain lines of work as they go about their daily task. In fact, as I think about it, there are probably thousands of ways such a technology, once developed, could be harnessed to promote peace and prosperity. I'm not at all competent to write on the uses of AR. I will, however, offer some theological thoughts related to this technology. Keep in mind, I am basing my comments on the mp3 story linked above, which talks about the frontiers of AR and not about its current capacities. 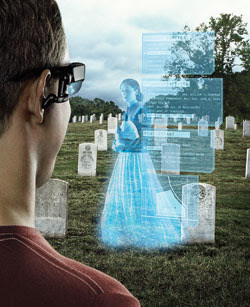 So what preliminary theological reflections does the prospect of AR technology raise? Let's assume the dream of the futurists and wonder what it would mean for us as the people of God. First, there is a real sense in which accepting the Lordship of Jesus Christ means accepting the world as it is given to us. By pursuing a technology which allows an altering of our sensory perceptions of the world, we choose to shut our eyes to this world, which is God's. I am sure that some could marshal "Christian" arguments for using AR to censor out things that pose threats to Christian purity. This reasoning must be rejected, however, because Jesus Christ reigns not over an abstract, ideal world, but over this world with all of its sin and lasciviousness. The Christian is called to love, serve, and even confront this world as it is, not create a world that is more suited to their particularities. Second, and this is merely an expansion on the first point, our second-highest calling is to love our neighbor as we love ourselves. Elie Wiesel said that the opposite of love was not hatred but indifference. Surely by censoring out those with whom we disagree we would avoid all sorts of conflict and the much-dreaded awkwardness of social interaction. Would this lead to a more peaceful, loving world? I think not. Surely those who are fighting with each other in some sense affirm the existence and legitimacy of the other party. Those who block others out completely deny the very existence of the person whom they are called to love. This would be a futuristic version of passing over to the other side of the road (Luke 10:25-37). Pharisees everywhere could rejoice at the advent of AR, not realizing that it isn't the opposing political opinions or harsh words from others that defile a person, but the hatred and sin that proceeds from our own hearts. Finally, assuming it could ever achieve the dreams that scientists and engineers have for it--and given the undeniable marvels of modern technology it is not insane to grant them at least this possibility--some applications of AR technology might imply nothing less than a loss of hope for this world. When we want to change our perception of reality, effectively deceiving ourselves, we may have reached the point where we no longer have hope that anything redemptive can occur in this world. We no longer believe that our dialogue with others or our words to them (or their words to us!) can be the sacramental voice of God. We no longer believe that a broken world can be redeemed. In fact, I think that we are saying that there is not only no hope (or at least there is less hope) for the world, we are saying that our actions and words are of little or no importance. Even if this news story is kind of silly, even if the reality of this technology is far-fetched, there is a serious development of AR being attempted by some of the brightest minds in our society. If this is the application of some of our best, what does this say about us as a society and as individuals? Is there something to all this, even as a way to see the truth of the human condition? I think it's possible and it makes theological sense: we are still those who want to be our own Lord, we are still those who love ourselves first and foremost, and we are still those who are unaware of genuine hope. This is reality that cannot be augmented, except by the Lord of this reality. Thanks for your post. I, as well, am very interested in these sorts of stories, not so much about whether they're possible but, as you say, about what they disclose about our society. In this vein, I wonder if you've read either Heidegger's 'The Question Concerning Technology' or perhaps more applicable to theology, Heidegger's appropriation in George Grant's 'Technology and Empire' (1969) or 'Technology and Justice' (1986)? Grant was a Canadian Christian philosopher of some repute in the post-WWII and Vietnam era, when biological weaponry was the technological preoccupation. I mention those names because I'm somewhat uncomfortable with where you apply the weight of theological criticism to new technologies, such as the one you mention. It seems to me that before we begin discussing new technologies, we need to familiarise ourselves and take great theological care with what 'technology' is simpliciter. I've been pursuing this myself in a few papers and must say, it's both fascinating and troubling, and I'm not sure I fully comprehend it. The line in your comment that intrigues me is where you say "I'm somewhat uncomfortable with where you apply the weight of theological criticism to new technologies..."
Would you mind explaining that a little more for my own learning? Perhaps a full post could even be in order. Feel free to use me as your negative example (seriously). As far as those Heidegger's work on tech, or Grant as a person, I'm not familiar at all, but thanks for the tip!